Oil pastels on read or pink cardstock paper, wavy lines and family portraits, cookie cutters stamping, using glitter glue and a brush - we played with different media and techniques to find the special ones this child wants to use for her Valentine cards this year. Foxy in Love was our inspiration for this activity. "Foxy in Love" by Emma Dodd is a beautiful story about the two best friends, a girl named Emily and a foxy named Foxy. Emily has to make her special Valentine card with all the things she loves in it. It is not an easy task. 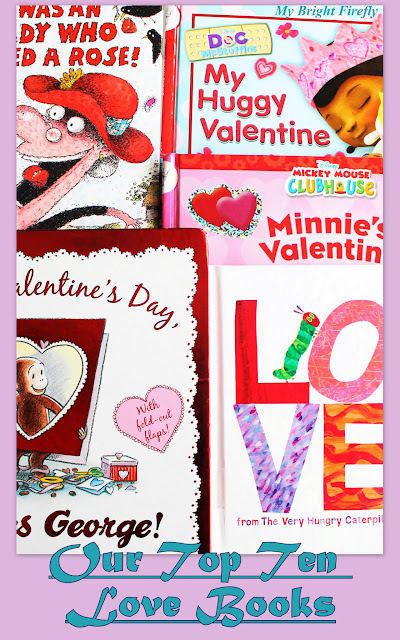 Only Foxy with his magic tail, funny rhymes, and selfless nature can help Emily to find the true meaning of Valentine's Day. Amazon affiliate link: Foxy in Love . For our card we used a bright pink cardstock paper folded in two. Oil pastels is our medium of choice for drawing on a colored paper. We needed to find and review the shades of red, pink, and purple; and to practice drawing wavy lines. We used oil pastels to draw a special back drop for our picture. The next step was to draw the special people and things. My Firefly chose markers for her doodles. Of course, she had to use glitter glue and a thin brush to decorate her scenery. At this point, there are all kinds of stories to go along with the pictures. This is a precious moment of bonding with your child through some time together and art. My Firefly wanted to draw her people inside the house and told me a sweet story about how happy of a family they are. She was willing to trace letters and learn how to draw a heart for the "I love your" message at the end. The next day we decided to pull our Valentine's cookie cutters. My Firefly enjoyed making pink by mixing white and red tempera paint. 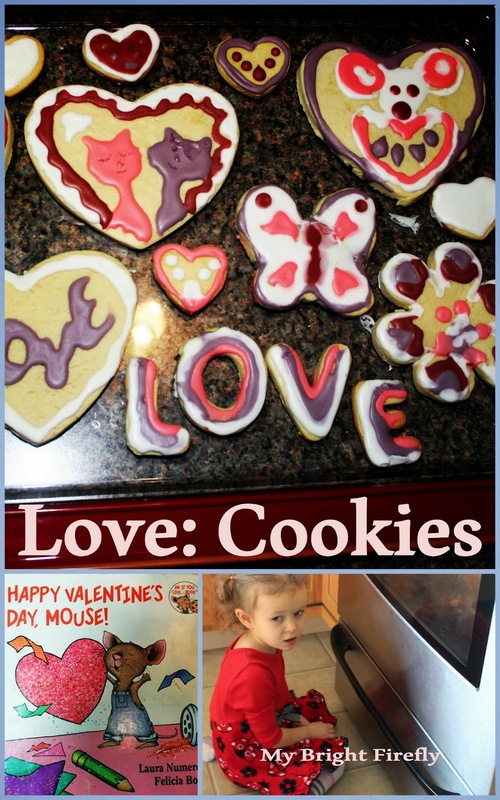 She stamped hearts and learned how to make the word "love" using cookie cutter letters. Our cookie cutters came from a Wilton 101 cookie cutters set. Amazon affiliate link: Wilton 2304-1104 101 Piece Cookie Cutter Set. After the paint dried, I cut our hearts on the cover for a peek-a-boo view of the Valentine's doodles underneath. I hope My Firefly's Granny will be happy to have her Valentine card! Happy Valentine's Day, Mouse! 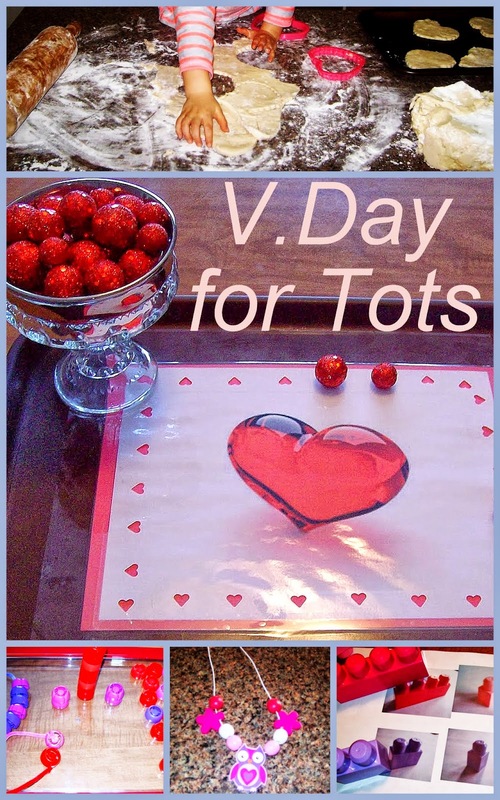 Fun Valentine's Cookies.